2 How do tasks work? In Update 1.55 "Royal Armour", we introduced the new game mechanic - Battle Tasks, these individual tasks bring variety into the gameplay and prevent situations when all the players in a battle try to complete one certain tasks ignoring mission objectives needed for a victory. Update 1.71 "New E.R.A" made big improvements in the way Battle tasks work. This is why every day a player will be given several random tasks of various difficulty levels. The more difficult the task is, the higher the reward. 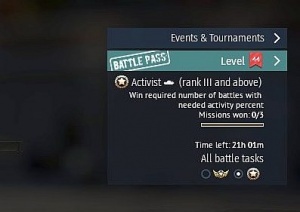 Battle tasks are freely available to players with Rank III vehicles in a little menu on the right side of the hanger user interface, under the "Events & Tournaments" tab. Battle tasks are cycled daily and each day, the player are able to fulfill two battle tasks. Daily battle tasks come in two levels of difficulty and in different game modes. Initially, two battle tasks are given for air force and ground force each, with unique tasks between Arcade mode and Realistic mode (there are no tasks for Simulator mode) for a total of four unique battle tasks. These tasks can be fulfilled with vehicles between Rank II to VI. Once these are finished, a new set of battle tasks appear in the same fashion, four total between the game modes and vehicle choices. These are slightly harder and require vehicles between Rank III to VI to be fulfilled. 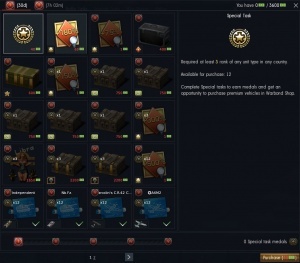 The first completed task will reward the player with 1,000 silver lions and 50 war bonds, though there is one specific task that gives 75 war bonds. The second completed task will reward the player with 2,000 silver lions and 100 war bonds, with one specific task giving 150 war bonds. Thus, a maximum of 3,000 silver lions and 225 war bonds can be earned each day. Daily tasks typically reset every 22 hours. If the suggested Battle Task is disliked by the player, it can be change for a designated amount of Silver Lions. The more often the task is changed, the more Silver Lions it will cost. After a specific number of changes in a day, the change will then charge for Golden Eagles only - so choose carefully. Special tasks are what the name suggest, they are special tasks which can be unlocked by receiving the required war bonds to purchase them from the War bond shop. They cost 30 war bonds. Special tasks operate in the same way as war bonds - However special tasks are very strict on the requirements. Some tasks may only be restricted to certain ranks and units, so caution must be taken to prevent earning an unwinnable special task. Once special tasks are bought from the Warbond shop, a choice will be provided between four different special tasks like the daily tasks, two for ground forces and air forces between Arcade and Realistic game modes. Please see the shop interface below on how to change and select them. Special tasks will reward the player with a battle trophy for universal back ups. The "How to's" around tasks in the game. To change a task from its current requirement to a new one, simply press the golden "Change Task" button on the bottom left corner of a task box in the menu. The "Change Task" button has the cost to change tasks in a "Change Task (###)" format. As stated earlier, changing tasks require a set amount of silver lions, but it gets progressively more expensive until it starts charging golden eagles for a change. When switching from game modes between AB to RB on the Hanger interface battle selection tab under the "To Battle!" button, this will be done autonomously. However, it is possible to simply change from the task menu by the bottom buttons of "Arcade Battles" and "Realistic Battles" (refer to the image). Game mode change from within the task menu. 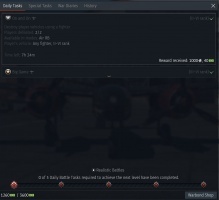 To check the progress of the daily task, simply look at the task icon that, as stated earlier, will be on the right side of the hangar user interface right under the "Events & Tournaments" tab. This will show a simplified version of a progression, such as the numbers completed compared to the numbers needed. Clicking on that tab icon will open up another tab in-game, which is the task menu. It will then display the progress of that task in more details along with the requirements needed. 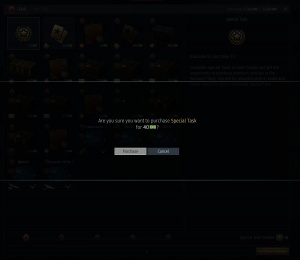 To check the progression of special tasks, the player must go into the task menu and a small tab on top of the menu will be labeled for "Special Tasks". Unfortunately, it is currently impossible to view the task progression while in the middle of a match. Once the task has been completed, you will notice a gold filled box with a green tick on the task. A large blue rectangular box will also show "Get Reward". 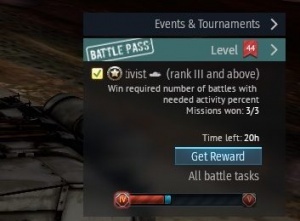 Click this box in order to obtain the task completion reward of silver lions and war bonds, the latter of which will be used in the war bond shop. Do note that unless the player performs this action, the task will remain unclaimed and thus any attempted progress at other tasks will not be counted. As soon as a task is completed, it should be claimed as soon as possible to not waste any possible progress on war bonds, medals, and the store levels! War bonds will accumulate in the balance up to a maximum of 3,600. When the game detects that a reward will cause the balance to exceed the maximum, it will notify the player that accepting the excess reward will cause the extras to be deleted to fit in the maximum storage. With completion of special tasks, the player will be rewarded the "special task medals" that allows the player to access more option in the war bond shop such as test drives, decals, decorations, and premium vehicles! To see the history of the war bonds completed, press the "History tab" to get a log of recent tasks completed and their rewards. The War bond shop is where players spend their well-earned war bonds on various in-game equipment such as universal back ups, boosters, test drives, decals, decorations, and even premium vehicles. It is also where players go to activate the special tasks. Compared to the Update 1.55 implementation, the war bond overhaul reinvented the way the war bond shop works in conjunction with the tasks. Aside from the war bond amount that must be obtained, special task medals and shop levels are considered in the options for sale for the player. Once the special war bond task has been purchased. it will then ask the player to select one of the tasks to commit towards (see image called "Special Task: Selection" on the right). Four tasks will be available, two for ground and air forces each for arcade and realistic mode, just like the regular daily tasks. Only one can be chosen, so the player must ensure they are in possession of the vehicles that meet the task requirements. Completing the special task will then open a battle trophy and grant the special medal task. If the player picks a task that is too hard or impossible to complete, it can be changed just like the daily task with the golden rectangular box labeled "Change task". Instead of a random selection like the daily tasks, this action will bring up the special task selection screen again to freely pick a single special task to commit towards. This will be the conditions for successfully completing the task, and getting you one step closer to upgrading the war bond shop! If a task is to hard, it can also be changed in the same way as conventional war bonds, for a sum of golden eagles or sliver lions - If the task has to be changed, it will pop up with a new screen, in a new selection window. This screen will show a list of tasks, which it can be now be changed to. Shop upgrade progress on the bottom. Level II - requires 5 completed daily tasks. Level III - requires 12 completed daily tasks. level IV - requires 22 completed daily tasks. Level V - requires 40 completed daily tasks. With two daily tasks able to be completed each day, a constant play through can get players up to a shop level V in 20 days. Q: Will my war bond disappear after the month's war bond shop is over? A: No! Your war bond amount will be retained in the following month. Q: Will my special task medals disappear after the month's war bond shop is over? A: Yes! The special task medals amount will reset the following month, which must be replenished for the next month's shop selections. Q: Will my war bond shop level reset after the month's war bond shop is over? A: Yes! The war bond shop level will reset. Q: How do I start a special task? A: Go to the war bond shop from the bottom right button of the task menu. The special tasks will be seen as purchasable as the very first item (top left) for 30 war bonds. Purchase it and select the tasks that is most suitable to have it as a special task. Q: How do I increase the war bond shop level? [Update] Battle tasks - First iteration of Battle tasks from 1.55. 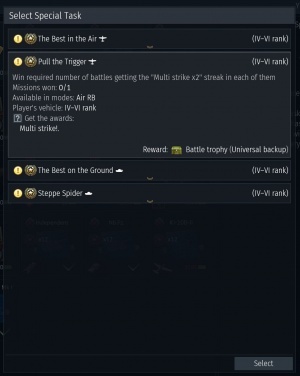 [Update] Updated Battle Tasks - Redesigned battle task from 1.71. This page was last edited on 1 March 2019, at 18:04.